Suddenly, each girl must decide what matters most: friendship, or love. What both girls don't know is that the stakes are even higher than either of them could have imagined. They're not the only ones who have noticed Jack's gift; his music has awakened an ancient evil--and a world both above and below which may not be mythical at all. We have paved over the ancient world but that does not mean we have erased it. 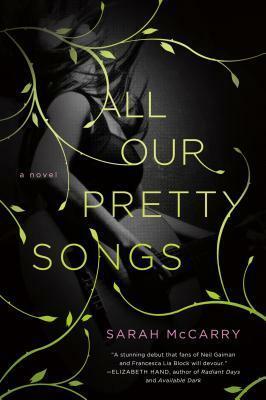 McCarry's beautifully rich narrative is smooth and seductive...effortlessy dropping references to authors from Rousseau to Block...Goths and romantics both will eagerly await the second installment of this suspenseful planned trilogy. "Booklist (starred review)"
[A] lush, spooky contemporary fairy tale the characters and landscapes come to life through careful detail and precise, poetic language. Haunting, otherworldly and heartbreaking. "Kirkus Reviews (starred)"
If you love Francesca Lia Block, Neil Gaiman, or mythology--or if you know what it's like to have best friend who is your soulmate--you will devour this book. (It also has a diverse cast of characters, which is something that you sadly don't see enough of in young-adult fiction.) "Rookie Magazine"
A stunning debut that fans of Neil Gaiman and Francesca Lia Block will devour. "Elizabeth Hand, author of Radiant Days and Available Dark"
A brilliant dose of the creepy and sublime. "Neesha Meminger, author of Into The Wise Dark and Jazz In Love"
I loved every minute I spent in McCarry's hypnotic and beautifully-drawn world. "Madeline Miller, New York Times bestselling and author of The Song of Achilles"
A punk rock remix of the myth of Orpheus that is as much about best friends as it is about first love. Buy it, love it, pass it along. "Alexander Chee, author of Edinburgh""